Learn how to setup a course in the iClicker software and adjust the course settings. Download and install the iClicker software, then launch the iClicker application by double-clicking on the icon. 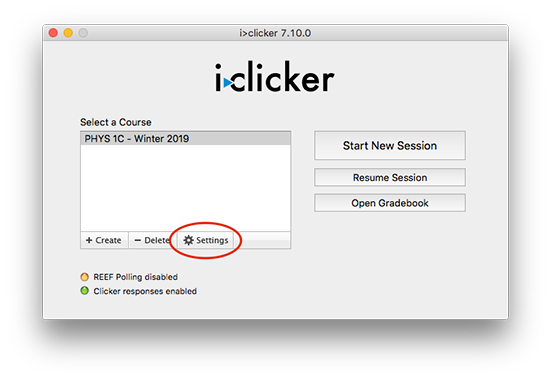 The iClicker window opens with no courses listed. Click Create. 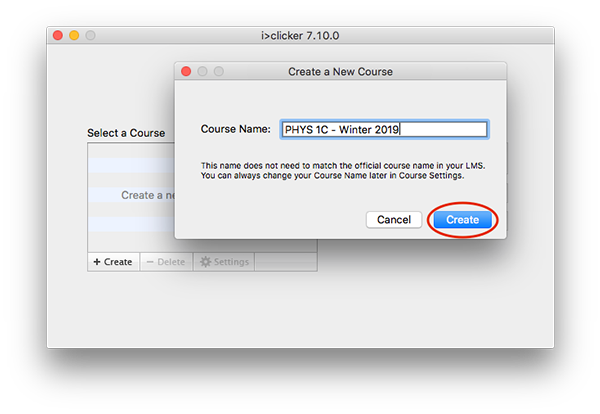 iClicker automatically creates a new course folder within the Classes folder in your iClicker folder. You will be returned to the main iClicker window where you will see the course just created in the list of courses. Repeat steps 1-3 as many times as necessary to create your courses. 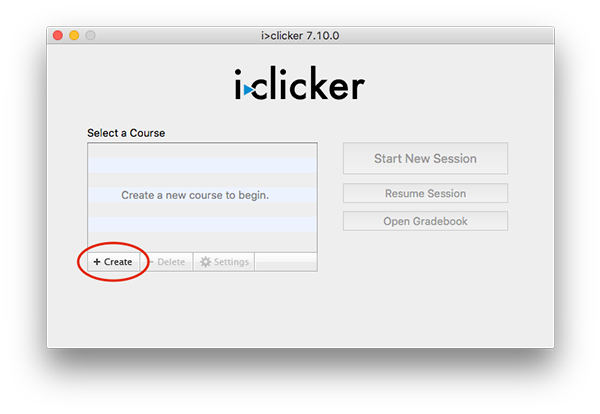 Click on Settings to customize iClicker for your course. 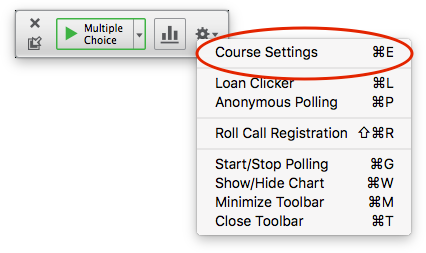 When you have an iClicker session open, settings can also be accessed from the iClicker Session Toolbar by clicking the Options button, then selecting Course Settings. If you are a Mac user, be sure the Prevent App Nap box at the bottom of the General tab is checked. In the Settings area, under the General tab, choose the radio buttons to select your Frequency code. All base stations installed in lecture halls (and certain classrooms) across campus have a frequency code listed on the base station as a recommendation for you to use. This helps prevent "phantom" responses from students in other rooms who may also be using iClickers. Reference the Frequency Chart below to see the frequencies recommended for base stations installed in lecture halls and classrooms. For classrooms where you bring your own base station, you are welcome to choose any frequency. (The frequencies starting with “D” are probably the least likely to have conflicts.) If a nearby classroom is using the same frequency, at the session start-up an advisory will appear on your computer to use a different frequency. 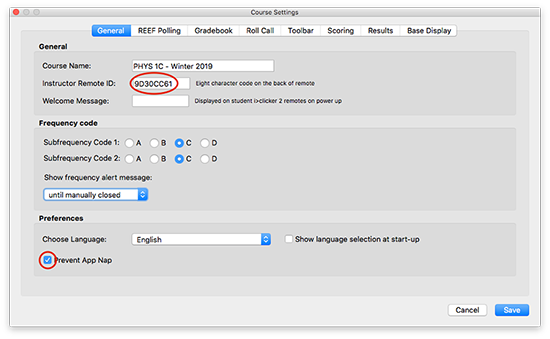 Important: In order for faculty or students to change frequency on their remotes, the desired course must be highlighted in the main iClicker window or the session must be started. 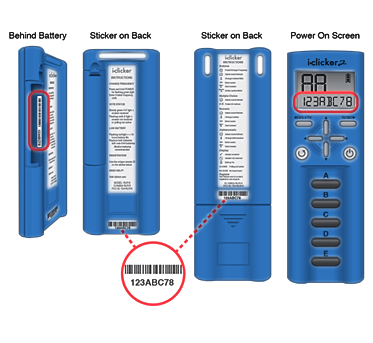 Read the instructions to set the frequency on iClicker remotes. The Scoring settings allow you to establish the point values that students earn for actively participating in class and for answering questions correctly. 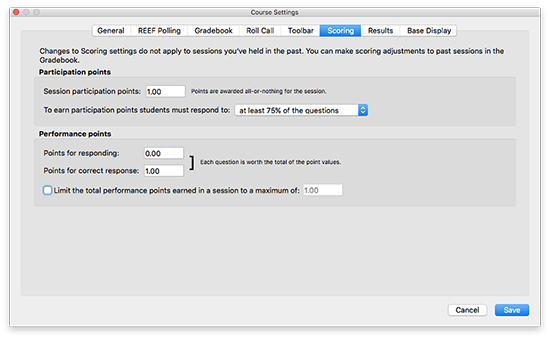 Important: Any changes made to the Scoring settings apply only to new polling sessions. Make adjustments to past sessions using the Gradebook. 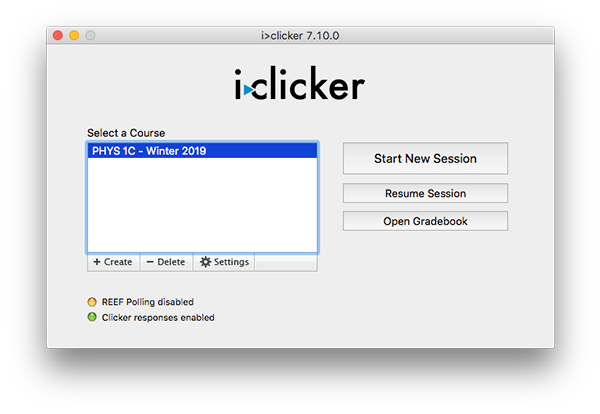 The iClicker software awards participation points to students who attend and vote during lecture (encouraging student engagement). The software awards participation points by overall session activity, not by individual question. Set the criteria to receive the participation points. To earn the session participation points, students must respond to a certain percentage of questions in a session. Depending upon the total number of questions, iClicker automatically calculates the minimum number of responses needed. Example: If you select the "all but one question" option and there are 10 questions in a session, a student must respond to at least 9 of the 10 questions (correctly or incorrectly) to earn the participation points. The software awards performance points to students by question for specific answers. Students can earn performance points without earning participation points, depending on your preference. Enter the points the student receives for responding to a question. This option allows you to enter the default number of points students receive for any answer. These are different from participation points in that they reward students for performance by question, whereas participation points reward students for participation by session. Specify the points awarded for a correct response. This field allows you to reward students for choosing the correct answer for a question. These points are earned in addition to any performance points you award for simply answering the question. Set a limit on the total number performance points a student may earn in a session. Example: if maximum performance points are set at 5 points, and a 10-question session is held with each question worth 1 point, even if a student answers all 10 questions correctly, the most he or she can earn for that session is 5 points. When you are finished making changes to scoring settings, click Save to save your changes. If you are going to enable REEF, instructions for setting it up are at this iClicker support page.